The Vail America Days parade is the red, white, and blue centerpiece of Vail’s Fourth of July celebrations. From humble beginnings, Vail America Days has grown into the region’s largest Independence Day celebration. This signature tradition of summertime in Vail is a big deal to locals. Especially Titter. 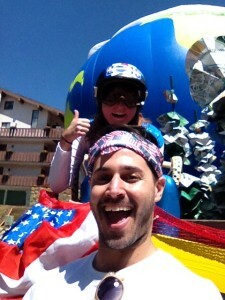 The Vail Resorts HR professional has won “Best Float” several years running. So she didn’t want to disappoint all this year’s hard-working volunteers—many of them children—with a sub par offering. It was go big or go home. And that was a tall order to fill. In the same underground parking lot, the Vail Daily and Vail Valley Foundation were erecting a 21-foot ski racer they hoped would “wow” parade goers. Bobbi holds up snowflakes made by local children for the float. I got to work, helping Titter and her team of lift operators, snow cat mechanics, and other assorted Vail Resorts personnel, turning the back of a flatbed truck into an Independence Day masterpiece. 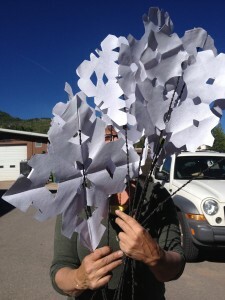 I twisted wire for snowflakes; stuck stars onto the truck’s hood; installed cleverly-designed trees made out of recycled trail maps; and hung race netting around the flatbed like bunting. The finished product was more impressive than I could have imagined. This might not be the Rose Parade but “Vail Welcomes the World,” a nod to Vail hosting the 2015 FIS Alpine World Ski Championships, was a rather ingenious home-spun creation. This finished float at the start of the parade. Local creativity continued to impress me on Fourth of July when I toured the patriotic designs that lined the access road East of Golden Peak; a mechanical dog built by local canine charity Dumb Friends League; Trinity Church’s Stomp-style band made out of garbage cans; even an alien spaceship built around a wheel chair. This was no ordinary small-town parade. 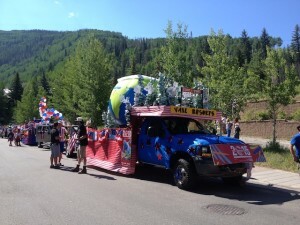 I began to understand what made Vail America Days’ parade such a holiday destination. 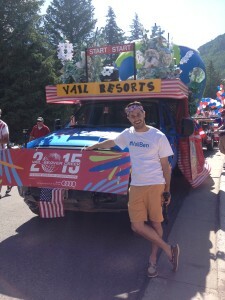 With my #VailBen shirt and my flag-printed bandana, I hit the route alongside the Vail Resorts float. The narrow streets of Vail Village overflowed with spectators of all ages dressed in every conceivable variation of red, white, and blue. I did my best to rile up the crowd, who was hungry for patriotism, 2015 swag, and, most notably, candy. Like a Halloween where the tricks and treats come to your door, kids held out bags and squealed when I brandished my bucket of tootsie rolls. They danced, sang, and stuffed their faces with sweets, overjoyed to partake in such a parent-approved sugar rush. 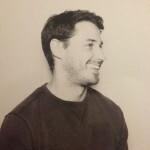 A two-hour procession of free candy? What’s more American than that! They crowned the Vail Resorts float “Best Float,” notching Bobbi and her team of dedicated volunteers another feather in their creative caps. And I almost lost my voice from cheering, infused by the energy of the crowd and maybe a few-too-many Tootsie Rolls. The Vail America Days fireworks at Golden Peak.